The RD-2000 features the same dual sound engines that power Roland's best acoustic and electric pianos, plus the PHA-50 progressive hammer-action keyboard with escapement. The keyboard features hybrid keys constructed of wood and molded materials, combining classic feel with rugged durability. Together with Roland's advanced sensor mechanism and hammer-action design, the PHA-50 delivers authentic grand piano touch that's right at home under your fingers. There's also a massive selection of top-quality ensemble sounds to cover any musical task, as well as two wave expansion slots for adding even more sounds. And with its innovative modern interface, the RD-2000 is the perfect master controller for working with today's software-based instruments on stage. Via a second SuperNATURAL-based sound engine, the RD-2000 gives you access to a wide range of classic electric pianos from the '60s, '70s, and '80s. 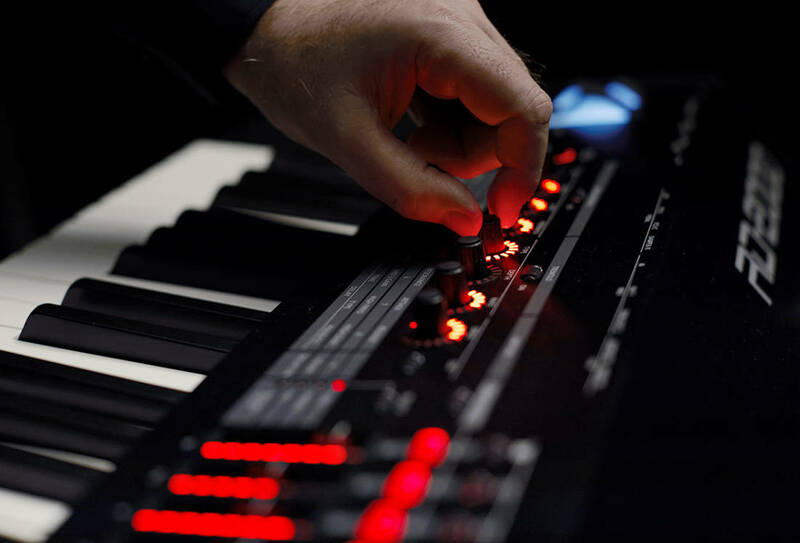 Included are newly developed recreations of the RD-1000 (the very first RD stage piano) and MKS-20 sound module from the 1980s. Vintage effects are also on hand for processing your EPs, including the famous BOSS CE-1 Chorus and Roland SDD-320 Dimension D.
In addition to its world-class pianos, the versatile RD-2000 includes over 1,100 additional sounds for covering any style of music with just one keyboard. Rolands SuperNATURAL technology provides highly expressive Virtual Tone Wheel organs, modern and vintage synths, clavinet, orchestral strings, brass, and many other sound types. At Roland's Axial sound website, you'll find even more sounds to load into the RD-2000's two wave expansion slots, including selections from previous RD instruments. And if you're stepping up from the RD-800, you'll be pleased to know that all your Live Sets are fully compatible with the RD-2000.